No one is moving, nothing is happening, and the scene is unexceptional, yet I find this photograph strangely poignant. There is something serene here, yet not with the promise of safety. Although the men are sitting quietly, almost as if posed for portraits, they remain soldiers in full combat gear with weapons drawn. But somehow they are, for a moment, seemingly at peace, just sitting and content with that. They may be waiting for something to do, yet the coming of evening bathes the scene in quietude. They could be at Vespers. The emotional resonance may be very simple: men sit calmly in the evening, self-contained, not asking for anything as the dark moves in. 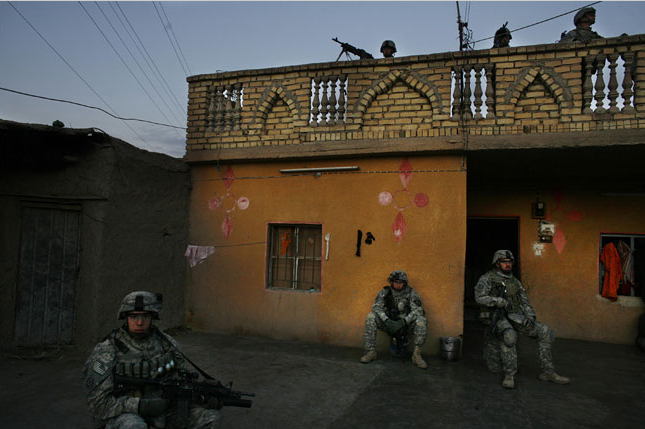 But other soldiers are hovering above them, and those sitting are in front of a house that belongs to others. So the emotional tone becomes complicated. The scene contains rural domesticity and military force, modern electrical lines and ancient designs in the brickwork, warm colors and deep isolation. The men seem at peace, but they each sit alone within a very small place that exists only for a moment, only until the war starts up again. The photo accompanied a New York Times report on 9 U.S. deaths from a bomb that went off while the soldiers were searching a house. The photo’s caption said, “American soldiers briefly occupied a house in Diyala Province on Wednesday as American forces hunted for insurgents and bombs.” That’s the same province where the 9 were killed. These troops might be staying “briefly,” but not so little that they haven’t posted guards and a machine gun on the roof. This clearly is dangerous duty: they could be attacked or they could be sitting above a bomb about to be detonated. In that context, just to sit quietly might be a moment of grace. Photograph by Jehad Nga/New York Times. ← Previous PostSight Gag: Who's Next?